Our family loves guacamole and salsa. We use it like most people use ketchup and mustard. 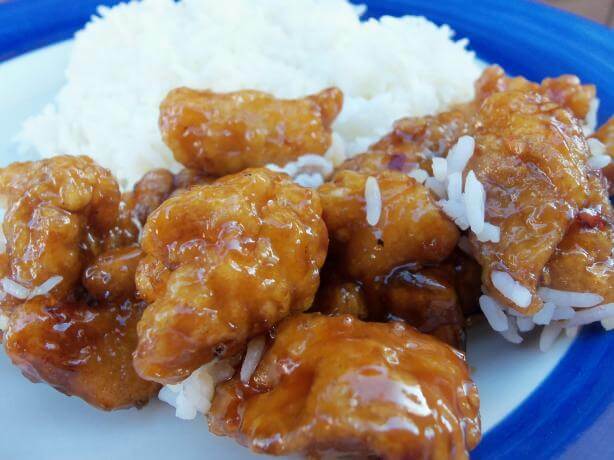 Our favorite will always be our own freshly made version that we’ve shared in the past. Although sometimes homemade is simply not an option especially when produce is out of season. So what is a person do to? Thankfully Wholly Guacamole® has always been there for us during these times. Their guacamole is superior—probably because they’re made with all natural ingredients and they don’t use preservatives or additives—to other store-bought guacamole we’ve tried and trust me we’ve tried a lot of them. When I heard that Wholly Guacamole® offered bloggers an opportunity join the Guac Squad as squawkers, I practically fell out of my chair. I could talk your ear off about their fantastic products and they’d give me inside information to share with your guys. It’s a win-win situation! Recently as part of the Guac Squad, I received a Guac Squad Summer Sampler. I was so excited about the package that I shared the above picture on Twitter. 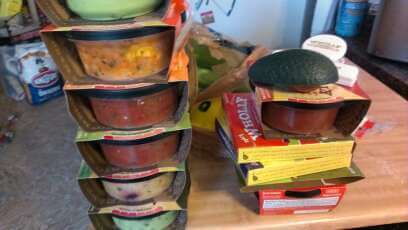 The biggest excitement was the eight containers of Wholly Salsa, which hit shelves a few months ago. As I sat staring at all the yummy goodness, my mind wandered with all the meal possibilities so here’s five ways to use Wholly Guacamole® and Wholly Salsa®. Chicken Tacos: A good chicken taco turns great with a spoonful of guacamole. Upgrade regular guacamole to the Wholly Salsa® Avocado Verde and you’ll have a fantastic chicken taco. Cheeseburger: A cheeseburger transforms when you replace the mayo, ketchup and mustard with a hearty spoonful of Wholly Guacamole® Spicy and a few slices of bacon for the best burger in town. Nachos: Regular nachos become super when you add taco meat, sour cream, Wholly Guacamole® Classic and Wholly Salsa® Medium. Quesadillas, tortilla chips, and veggie spears all taste better with guacamole. 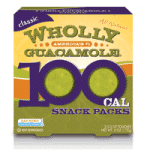 The Wholly Guacamole® – 100 Calorie Snack Packs in Classic and Spicy are perfect for adding just a hint of guacamole flavor without eating an entire package. What you’ve never eaten the remained of a package of guacamole because if you don’t it will turn brown and nasty? Me neither. Mexican Food: I saved our favorite for last, the Wholly Salsa® Roasted Tomato. We used left over taco meat and skillet fried diced potatoes as a quick an easy lunch one afternoon. We topped it with some shredded cheese and this salsa for the perfect meat and potato burritos. We even tried the Wholly Salsa® Red Pepper Mango over skillet chicken but it wasn’t a hit for us. I guess we’re not much of a fruit salsa over chicken family. 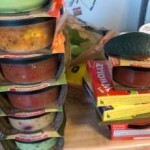 I still have the Wholly Salsa® Pineapple and Wholly Salsa® Guacamole & Spicy Pico sitting in the fridge. Share your recipe idea in the comment section. By now I know you’re thinking, “Where can I get some of this yumminess?” Wholly Guacamole® makes it easy as entering your zip code on their Where to Find Us page. But don’t run out just yet because if you jump over to their Facebook page, you can download a coupon to save you some cash at the register. 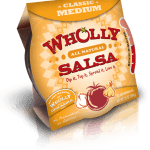 Wholly Guacamole® will give one lucky winner a sample pack of Wholly products. Don’t forget to enter our other giveaway, too! Disclosure: Wholly Guacamole® provided our family with product for this review. Read our full disclosure. Read our giveaway rules. 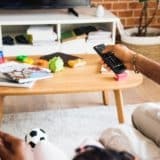 Links may contain my affiliate ID. My favorite use for the Wholly Guacamole is in a seven layer dip with tortilla chips. I love their guacamole and wholly queso on my tacos with all the fixins. I like to put it on my grilled steaks!!!!!!!!! I love it in a burger. We use Wholly Guacamole in our dips. Best products on the market. 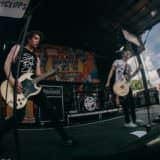 We love them! I love both salsa and guac on salads! I put Wholly Salsa on my eggs in the morning. 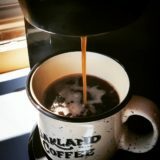 It’s so good. I also use it for dipping with chips. My favorite use is with yummy blue corn chips! MM!! Chips and Dips but would love to try it on a cheeseburger now! Thanks for the chance to win! Chips and dip for me! I enjoy Wholly Guacamole on my salad instead of Dressing! Wholly Pineapple is my Salsa of choice! as a dip with chips! I love it on Taco Salad or Quesadillas! I just like to eat it plain with tortilla chips. My favorite use for Wholly Guacamole is for pure tortilla chip dipping! I love to spread it on sandwiches. love using the salsa on chicken. I like to eat them as a dip, on a nice salty tortilla chip. My favorite use for Wholly Guacamole and Wholly Salsa is to top tacos and burritos! I use the salsa in my scrambled eggs. My favorite use for either products is on a soft taco. Oh I LOVE Wholly Guacamole just smeared all over my sandwiches so yummy. My favorite is the original guacamole as a dip for tortilla chips. I like it mixed with some diced tomatoes and served as a dip with blue corn tortilla chips. My favorite is to have Wholly Guacamole with fresh fried tortilla chips. I use it for my nachos.. I love guacamole on my burgers! I love guacamole on a juicy burger with bacon! We love Wholly Guacamle on chips! as a dip for chips. I like guacamole with fresh chips. I love BLTs with Guacamole! I love putting guacamole on a ritz cracker with a little bit of canned chicken. Great compliments to grilled items for dips & unique sauces. I love Wholly Salsa on home-made burritos and quesadillas! i love wholly guac with chips or on top of nachos. What is your favorite use for Wholly Guacamole or Wholly Salsa? My favorite use for Wholly Guacamole is on Fajitas! But I use it in a lot of different meals. I love putting guacamole on my nachos. I like to use the salsa as a topping on fish. 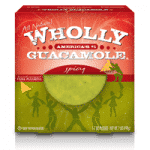 I love to use the wholly guacamole 100 calorie packs on tacos or quesadillas! I love using the guacamole on my taco salads. Thanks. I LOVE Guac on chips, but also- I slather it right onto cold turkey sandwiches…. 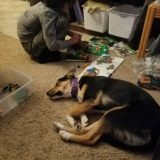 oh boy it is ever good. Makes the sandwiches heavenly. I add Wholly Guacamole to my tomato and cheese omelet. I like to put the salsa on my hamburger. I always use the Guacamole. would be great with fajitas. I love Wholly Guacamole on my home made Burritos. 🙂 Thank you.